As the home to famous historical personalities such as Mozart and delicious foods such as wienerschnitzel, Austria continues to be one of the most sought after destinations for work, travel, and corporate endeavors. Similarly to Germany, Austria is incredibly passionate about its commitment to quality in both industry and every day life. This emphasis on quality along with its stunning mountain ranges, lakes, and forests contributes to its almost unparalleled quality of life. This in turn draws foreign interests from around the world for both temporary and permanent adventures in Austria. Among these foreign individuals are thousands of Canadians. As a Canadian, if you have affairs in Austria beyond the scope of vacation you will probably require some Canadian documents for use in Austria. These can include Canadian university degrees, transcripts, birth certificate, marriage certificate, certificate of incorporation, or articles of incorporation and can be for reasons such as to pursue an education, secure employment, resolve estate matters, or do business in Austria. Whatever your purposes, your Canadian documents will have to go through a process of validation before they will be accepted in Austria. Austria and over 100 other countries use the well known apostille process. However, since Canada is not a signatory of the Hague apostille convention, it uses the original two-step process of authentication and legalization. In short, Canada does not have an apostille process and this can be confusing if you have been told to get a Canadian apostille for Austria. Fortunately, you’ve come to the right place. There are actually a few different types of authentication but the most common one is authentication at Global Affairs Canada here in Ottawa. Formerly known as Foreign Affairs Canada, the authentication stamp, signature, and seal at Global Affairs Canada is the most widely used authentication and the one most frequently accepted by foreign embassies including the Austrian embassy, which also located in Ottawa. If you have Canadian documents that need to be authenticated, make sure that they meet the requirements outlined by Global Affairs Canada otherwise they will not be able to authenticate your documents. Furthermore, Global Affairs Canada can take over 20 business days to authenticate documents they have received. In the event that your documents are missing a requirement, getting your document authenticated can take a very long time. Once authentication has been completed, your Canadian document is now valid for legalization at the consular section of the embassy of Austria. Just like Global Affairs Canada, the embassy has its own requirements that need to be met before they can legalize your documents. These requirements include additional documentation as well as a processing fee and these requirements change frequently. They also have their own processing times which can vary significantly. This makes legalization the hardest step to complete and where the most delays occur. In addition to the potential 20 business day waiting time for authentication at Global Affairs Canada, authentication and legalization can easily take over a month to get done. This is assuming both steps are completed properly on the first attempt, which is very unlikely even if you have gone through this process before. It is for these reasons why our company exists. Over 25 years ago we helped our first client with their Canadian documents for use abroad. Since then, we have helped tens of thousands of Canadians with their foreign affairs all around the world. We have helped Canadians from all industries and backgrounds including law firms, engineering companies, pharmaceutical companies, students, independent professionals, and even former Canadian prime ministers. 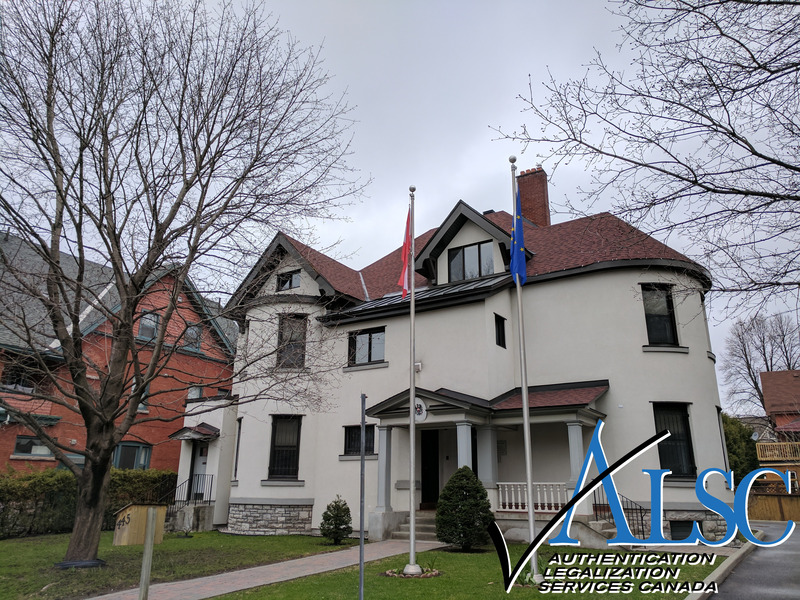 We are experts in Canadian documents such as birth certificates, powers of attorney, certificates of incorporation, articles of incorporation, divorce certificates, RCMP police checks and many more. As the first company to provide this service, we developed processes that have become the industry standards and continue to find ways to improve our services. We offer three authentication service speeds which are designed to save you time and money. The first is our priority same day authentication service wherein we can have your documents authenticated as quickly as the same day they arrive in our office. The second is our standard 3 business day service which balances speed with affordability. The third is our economy 10 business day service which is a convenient option if you have numerous documents to process on a budget. All three of these speeds save you time and with the guidance of our experts, ensures there are no errors and any resulting delays. Although we cannot influence the processing time for legalization at the Austrian embassy, the close professional relationship we have built with their staff over the years allows us to be one of the first to know when new requirements are introduced or existing ones modified. This allows us to provide a smooth and easy legalization with minimal delays when there would otherwise be many. As our client you will receive updates every step of the way. 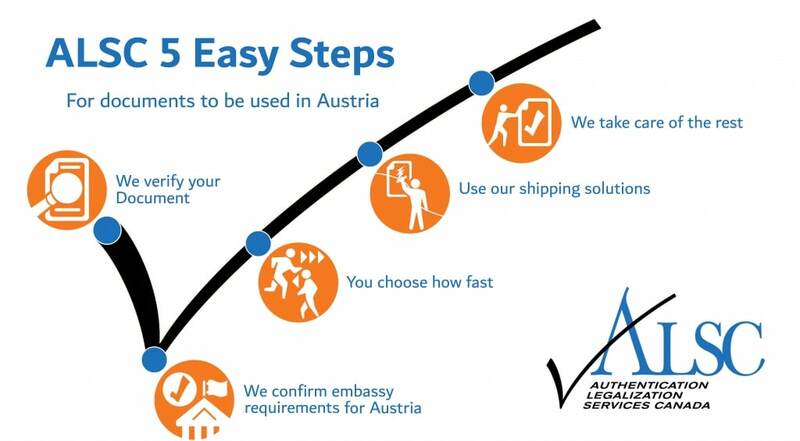 You will also have your own personal agent to assist you in preparing your documents and requirements for authentication and legalization for Austria. Our experts will be ready to help you at any time during our office hours until the process is completed. Upon completion we can ship your documents anywhere in the world via courier. If you have Canadian documents that need to be used in Austria for any purpose, contact us! If you want more information on some Canadian documents for use in Austria and how to get them, continue reading. Canadian birth certificates, marriage certificates, and death certificates are commonly requested for purposes relating to citizenship, immigration, marriage, employment, or inheritance in Austria. Canadian vital statistics documents are some of the easiest documents to process for authentication and legalization for Austria. This is namely because the signatures on all Canadian vital statistics documents are on file at Global Affairs Canada which makes them valid for authentication in the state they are issued. This is rarely the case with other Canadian documents. This also means they do not require notarization by a lawyer or notary public. Although you can make a notarized copy of your Canadian birth certificate, marriage certificate, or death certificate, we do not recommend you do this for two reasons. First, it is always best to use original documents as notarized copies are not always accepted by requesting parties in Austria even if they have been appropriately authenticated and legalized and thus technically valid for use in Austria. Second, notarized copies are often more expensive than simply ordering a new birth certificate, marriage certificate, or death certificate. Keep in mind that these documents must come directly from the vital statistics office of the province in which the life event occurred. Documents such as marriage certificates issued by the church or death certificates issued by the funeral home are not valid for authentication at Global Affairs Canada even if they have been notarized by a lawyer or notary public. Furthermore, short form versions of these documents such as short form birth certificates also cannot be authenticated by Global Affairs. That being said, it is very easy to get your Canadian birth certificate, marriage certificate, or death certificate if you are having difficulty finding yours or worry it may not be in a good enough condition to go through the authentication and legalization process. This happens quite often since these documents are rarely requested for use within Canada. If you need to order a new Canadian birth certificate, marriage certificate, or death certificate you can do so using the links provided below. Lots of our clients choose to have their Canadian vital statistics documents shipped directly to our office to save processing time. This is especially recommended if you are currently living outside of Canada as it is possible to have your Canadian birth certificate, marriage certificate, or death certificate authenticated and legalized for use in Austria before it would arrive to you unprocessed by mail elsewhere in the world. Along with it’s countless job opportunities, Austria is also home to some of the most prestigious post-secondary institutions in Europe. As such, it likely you have been requested to provide some manner of Canadian educational documents for either one of these two reasons. Similarly to Canadian vital statistics documents, Canadian educational documents are easy to process for use in Austria. Most university degrees, transcripts, and high school diplomas contain signatures on file at Global Affairs Canada which makes them valid for authentication. Some other educational documents such as TESOL or TEFL diplomas will require notarization by a Canadian lawyer or notary public. If you have a TESOL or TEFL certificate or diploma we recommend you contact us immediately as Global Affairs Canada cannot authenticate all TESOL or TEFL documents even if they have been notarized. If need to process you Canadian university degree for use in Austria, it is likely you already have the degree with you or in an accessible location. However, you may not want process the original for authentication and legalization especially if it is large. This is because it can cost quite a bit more to ship and has a higher likelihood of becoming damaged when handled by staff at the Austrian consulate. In this case, it is best to make a notarized copy of your degree which we can do for you when you use our services. We also provide special protective shipping envelopes for almost all sizes of degrees and documents for all our clients at no additional cost. Prior to doing so, make sure you check with the requesting party in Austria to see if a notarized copy of your degree will suffice. If you do not currently have your Canadian university degree or transcripts for use in Austria you can refer to the links below to order them. Our modern day society is very fast paced and waiting is one of the most stressful things in such a world, especially if that waiting is due to unforeseen circumstances, delays, or miscommunication. There are deadlines to be met and this is no exception when it comes to foreign affairs. Authentication and legalization of Canadian documents for use in Austria can and often does involve lots of waiting, delays, stress, and miscommunication. At ALSC, our experts are here to shoulder that burden for you. We have made it our mission to consistently provide an unparalleled service to Canadians both in Canada and abroad. Our A+ rating with the BBB, notable membership with the Canadian Chamber of Commerce, and our growing number of 5-star reviews on Facebook and Google prove that this is exactly what we do. One of the ways in which we have done this in recent years is to become the most accessible service provide in our industry via our service centers across Canada. These service centers allow our clients to drop off their documents and have them shipped free of charge to our headquarters in Ottawa for processing via FedEx. This saves the long trip to the post office as well as shipping costs. Once completed they can be shipped to any one of our service centers by FedEx free of charge for pick up. Please note you must book an appointment by contacting our head office prior to using our service centers. We can also ship your documents anywhere else in the world they need to go at an affordable cost. It may feel like you are a long way from completing this process but you are closer than you think. If you choose us, once the process has begun your only job will be to relax and enjoy the extra time you have saved with your friends, family, and other business endeavors. Click below to get started with ALSC for your Canadian documents for use in Austria!